Among the many changes our bodies go through while pregnant, many of us moms experience Ab Seperation. Also know as Diastasis Recti. It’s very common, two out of three pregnant women experience this. 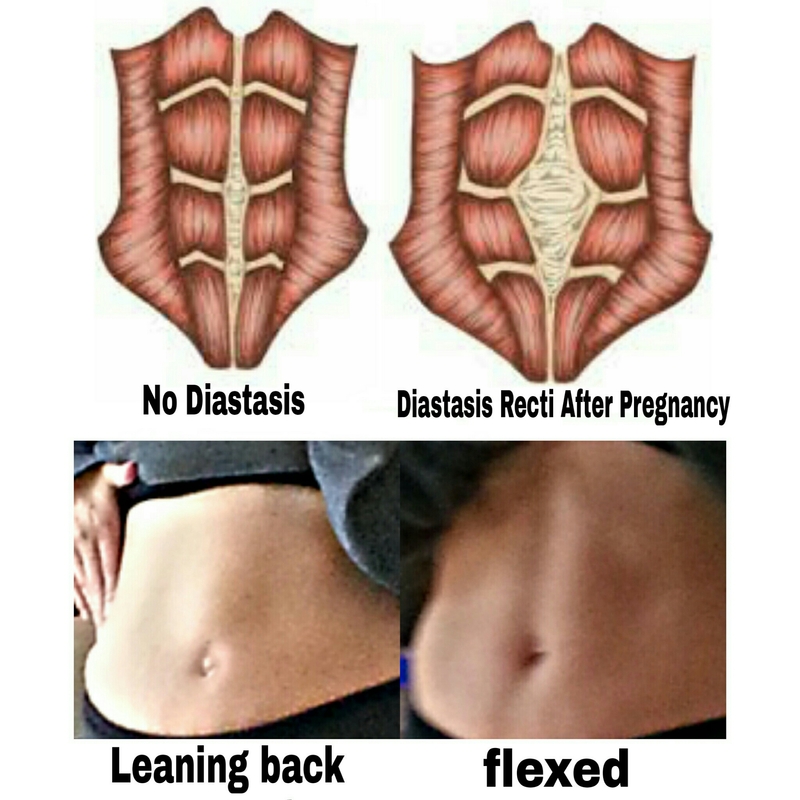 So what exactly is Diastasis Recti? Basically that fancy word means your belly sticks out because the space between your left and right abdominal muscles has widened. You might call it a “pooch.” When the ab muscles move aside like this, the uterus, bowels, and other organs have only a thin band of connective tissue in front to hold them in place. I was lucky enough to be one of the 2 women that get it. (Insert sarcasm) 😉 Here is a collage picture of what abdominal muscles look like prior to pregnancy. And what they look like when Diastasis Recti has occurred. The bottom part of the picture is my abdomen 9 months postpartum after baby #4. First picture I’m leaning back and you can see the bulge in the middle. Second picture I’m flexing holding that bulge in. Many women have emailed me regarding this. I am not a doctor, but have spoke with several regarding Diastasis Recti. I have also had four pregnancies where I’ve experienced seperation each time. Every situation is different so I will share what worked best for me. Below I will go over a few questions women have asked. I personally feel it depends on how serious the seperation is. Postpartum I would wait at least 6-9 weeks to allow your uterus to shrink back down. At your postpartum check up talk about it with your doctor. I never train abs. I focus on keeping my core tight with every exercise I do. But never do anything with direct pressure on my abdomen. I also have a few minor hernias so direct pressure causes pain. I have known women that actually cause more damage by doing abdominal exercises. Especially when adding weight. If you have a large gap any pressure is going to cause it to grow wider, essentially causing more of a “pooch”. Chances are, it won’t completely close without surgery to repair it. (*note: there are a few techniques available too. They are nonsurgical. The Tubler Technique and Mutu, I’m not familiar with either and have read mixed reviews so you may look into them yourself.) However it will narrow and sometimes become unnoticeable. Depending on how lean your body is you may not see it at all. Below is a picture of me at my leanest, you can see the gap down the middle. It’s not terribly bad, but with time it has grown closer together. ⚫ When starting to exercise remember less is more. 1 myth is that working abs will give you an amazing 6-pack. This is untrue. Weight loss and loosing body fat is what make abs show. ⚫ Start slow, test the waters so to speak. Start with movements like seated movements (pictured below) and planking that don’t put direct pressure on your abdominals. You may feel fine during your workout but feel pain later. Remember there is a difference between soreness and pain caused from your muscles seperating more. Here are a few core exercises to try. ⚫ Protect your core and back. During workouts while lifting heavy I always wear a belt. It helps hold everything in while giving support. Don’t just rely on the belt though keep that core tight! I saw the story on the internet on the new most desired viral body part they’re calling “AB Crack” when this is what it really is! I hope no one tries to get this on purpose! Wow! I’m going to have to look into that! Lol. As silly as it sounds, someone, somewhere will try to get it!